I might not be an expert, but I have been using the bullet journal (not sure what that is? Click here!) since 2014. I used my bullet journal to handle my college classes, organize a club, tackle work tasks, plan a wedding, prepare for a cross-country move, set up a blog, and every little thing in between. It’s been a lifesaver for getting my scattered brain on paper and on schedule. Of course, it hasn’t been a fix-all. It required a fair amount of work and dedication. So I wanted to take a few minutes to share some bullet journal tips I’ve discovered in my time planning with the bullet journal and hopefully help you find and maintain a method of organization that suites you and your unique challenges. When you first start your bullet journal, it can be easy to go a little crazy making all kinds of collections. Believe me, I did the same thing when I first started. There’s just so much out there to get down, how could I not? But the initial excitement can wear off a bit, leaving you feeling overwhelmed with a thousand lists that you feel you need to keep up with and leaving you with more work than organization. Think of the bullet journal as a new relationship. At first, you can’t keep your hands off of it and there is a ton of passion. You might feel a little giddy. But as the relationship goes on and the newness wears off, you might find that making large commitments early on will come back to bite you. When you first start out, indulge and make a collection or two. Perhaps write a list of lists you’d like to incorporate so you don’t forget all those good ideas that flood to you. In a month, if you are still going strong, you could consider adding a few. Just focus on your daily and monthly planning until you get into a routine. Just remember the goal is to finish, not be perfect. There were a few times in years past where I would barely touch my bullet journal, having only a few entries each month. Naturally, during these times, my tasks were not nearly as organized as I wished they’d be. But I struggled to dedicate myself to a routine with the bullet journal, which made it very difficult to utilize. To use the bullet journal system best, you need to make it systematic. Have a routine every day where you set up your daily spread and plot out your tasks. You could do this the night before or while you are having your morning coffee. I personally prefer doing it the night before so I can jump into my day, but to each their own. However, I have found that a morning routine works perfect for my Morning Pages. If you create a habit, your days will develop a rhythm that will help you organize your time. The bullet journal is adaptable to the unique user. However, it can be difficult to go online and see other peoples’ gorgeous journals and not feel kinda crappy about your own. But don’t compare yourself to others! What works for them will not necessarily work for you. That’s the whole beauty of the bullet journal, after all. Don’t look at someone else’s planner and think “I have to make my planner like X”. Your planner can be messy and full of scribbles and not hold a single doodle, and this is OK. If you want to spend the time to gussy up your pages, by all means, but don’t feel that you have to. Your planner is for you to plan, and no one else has to see if if you don’t want to share, so don’t let worrying about how pretty it is stop you from getting started in the first place. You might try the traditional Ryder Carroll method and feel like it isn’t that effective. So dump it! Try something new! There are tons of ways to skin this cat, so don’t restrict yourself to just one or two. I personally enjoy my monthly calendar to be just that- a calendar, with the boxes and whatnot. Some people enjoy listing out the days, some people don’t do monthly calendars at all! I recently switched my daily entry format and discovered that I loved it – much to my surprise. My point is, don’t feel bad if you want to kick a method to the curb and try another. Find the best organization system for you, and keep experimenting until you find it. If you are struggling to come up with different things to try in the bullet journal, check out these spreads. One of the neat things I’ve found about the bullet journal is the community attached to it! There are so many Facebook Groups, Pinterest boards, etc that allow you to find other planner addicts and connect with them (You can follow my Pinterest and Facebook to get you started!). Bullet journalers come from all walks of life- teens, stay-at-home parents, professionals, hobbyists, freelancers, students, creatives, and egg heads. And I have found that the people in this community tend to be positive, motivated, and encouraging people. So go out there and find them! While it’s true that you could use the bullet journal with a cheap notebook and any old pen, I find that I am more motivated to use it every day when I like the way it looks and feels. When I first started, I tentatively bought a fairly inexpensive Ecosystem journal, which did a marvelous job and was quite sturdy. However, I have wine taste on a beer budget, and I found myself drawn towards the nicer end of the spectrum. After I completed my Ecosystem, I bought myself a Leuchtturm 1917 as a little reward for staying with my bullet journal practice, and let me tell you – I’m in love. I pull my bullet journal out with a flourish each day and enjoy the process of writing in it. I have also allowed myself other nice things over time, like my Staedtler Triplus Fineliner set, which make me feel like I’m having fun while I’m planning. You can check out all the other goodies I use every day on my Supplies page. If you aren’t a stationary addict like myself, find other ways to invest in your bullet journal ritual. Perhaps buy a nicer desk organization set to add a touch of fancy to your desk, or a better lamp. If music is what helps propel you through your day, I highly recommend Amazon Music, they have a wide variety of stations, are ad free, and have a free trial. If you have noisy neighbors or coworkers, perhaps get yourself some noise cancelling headphones. Whatever helps you be more focused and driven is something worth spending money on. My one caveat – invest in these things slowly. Don’t go buy all these on a whim because you want to make sure you’ll stay with the bullet journal. I’m currently using these supplies as incentives to stay committed to my goals (see how here). Just remember that it is OK to spend money on yourself if it helps you stay productive – you are worth it. Where you work is important to your state of mind. If it is messy and dark, you are likely going to struggled to focus. Try adding some light and cleaning up the space. Organize your desk, toss out junk, and try adding some decor that inspires you. Put up pictures of places you want to go, people you love, stuff that gets you feeling happy overall. Perhaps you could add a plant or two to brighten up your space. You should create your space to give you a pleasant and productive feeling when you sit down to work. If there is one single thing other than daily entries that you should have in your bullet journal, it’s a habit tracker. These things are wildly informative and useful. They remind you to do things (check secondary email, floss, water plants, etc) and make you aware of how often you do certain things. For example, I can accidentally go weeks without exercising and still think it was only the other day. The habit tracker forces me to be honest with myself and live a more truthful life. I can’t imagine not having one now that I have integrated it into my daily routine. And it is so customizable! You can track how often you meditate, paint your toes, or lucid dream – the possibilities are endless! So there you have it! Some of them might seem like common sense, but I had to learn them the hard way. 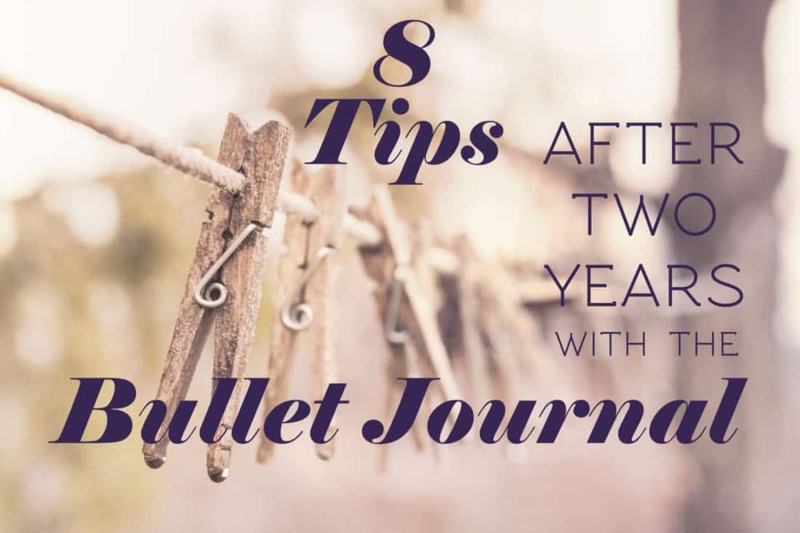 I hope that some of these bullet journal tips and tricks can help you have a smoother bullet journal journey and you can create your own planner peace! What are some bits of wisdom you have learned from your bullet journal? Comment below! Exactly. Many of the negative comments I see about Bullet Journaling are based around the idea, “I don’t have time to waste on such an elaborate journal”. But of course the people who post their beautiful BuJo pages are at one end of the BuJo spectrum. I will never publish my BuJo pages because 1) it’s my personal organiser and 2) it’s practical but not beautiful. No one gets to see the basic but practical BuJo variants. Exactly!! I agree with you completely 🙂 It’s about how to make it work for you, and if keeping your journal private helps you stay productive, then fantastic! I actually find the opposite to work for me – if I share, I’m more likely to want to do it right and keep doing it every day/week/month. It’s all about finding how your bullet journal best works with your personality and preferences! I love this post. I personally periodically lurk through bullet journal pins because I love the creativity and immense possibilities for personalization. All to often though posts are for early on and it’s sometimes hard to find things that are for ‘more experienced?’ if there’s such a thing. I have yet to be able to incorporate a habit tracker and was ready to give up the idea… but your post put the wheels in motion. Keep that simple too. Thanks for a wonderful post. Blessings! I’m so glad you enjoyed the post, Laura! I’m thrilled that some of my trials and errors can be of help. Good luck getting a habit tracker started! They are one of the most useful and simple trackers you can keep. If you’re looking for a little more inspiration, check out my Habit Tracker post for ideas! I’m so glad you found this post helpful! There is so much wonderful information out there in the bullet journal community – and so much eye candy! It’s great that you’ve found inspiration in both the minimalist spreads and the artistic ones, as there is so much gorgeousness in both styles. If you want to join in more bullet journal conversation, you should definitely head over to BulletJournalHangout.com. It’s the only message board dedicated solely to bullet journaling. I’m sure you’ll love it! This is a huge help! I have just started a bullet journal and these are some great tips! Thanks a lot! It’s my pleasure 🙂 good luck starting your bullet journal, and feel free to email me with any questions! I’m quite new to all of this and I find your blog very helpful. I have some questions but I’m heading over to “the den” for help. Love to be a part of this community. Wow! Two years is like a whole lot? Have you tried digital bullet journaling? I know, it doesn’t feel like it’s been that long! I have tried digital planning methods, but I’ve never really been able to make it work for me. I find that a nice pen on good paper is a happy combo for me! I have to respectfully disagree that a habit tracker is an essential item (I thought your other suggestions were spot on!). The bullet journal’s value lies in it’s flexibility and customizability, so truly there is no single essential for every bujo user. I personally find trackers don’t work for me. Because the tracker is on a different page most of the time, it’s very much out of sight, out of mind. I personally find that writing tasks each day makes me more accountable. Writing is more of a commitment to me than coloring in a box (or what have you). I place my repeated tasks that many would use a tracker for at the top of my daily lists and make them top priority. Certainly try a tracker if you’re interested, but don’t feel bad about kicking it to the curb if it feels pointless. Thanks for the tips! I agree that at first it can get really overwhelming to commit to too many elements of a bullet journal. One tip I have found for the busy weeks is to just make out a weekly tracker in the beginning, and plan to skip the daily tracker for that particular week. For example, when I travel for work, I find that I don’t have much time or energy to put towards planning out the weather, etc. for the next day’s entry – plus I’ve already packed everything! So before I leave the beginning of the week I will just put together a weekly spread and jot down any notes that I have at that point such as dates, meetings, flights, etc. You are definitely right that connecting with other journalers helps us each expand our creativity! Thanks again! Thanks for your kind words! And that sounds like a great idea, using a weekly instead of a daily for hectic weeks. I know that if I have both a weekly and a daily going at the same time, I never check my weekly. But that might be just the ticket! This entry was SOOOOOO helpful for me – it hit me right at the perfect time – thank you. I’m going to print this & put it on my wall! I’m glad it was helpful 🙂 Feel free to message me if you ever have any questions as you go forward! Your blog was very helpful to me, I am new to journaling so the imformation was very helpful to get me started. It’s my pleasure, and thank you so much for dropping by and reading! I wanted to let you know that when I’m clicking links in your posts to go from one post to another, they are not working. All links take me back to the main bullet journal page. Casey, thanks for letting me know! When the site transferred, all the old URLs for my blog posts changed, so I am currently going through and updating them to go to the proper page. It should all be fixed very soon, so sorry about that in the meantime!